This review has not yet been approved by the owner of this writing service. If you are the webmaster of Ukdissertation.co.uk, please Contact Us to approve or remove this review. 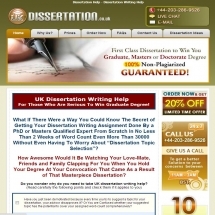 The designers and promoters of UKDissertation have very peculiar understanding of what is supposed to make the site appealing and impressive. This website looks like an amalgamation of all the worst scam-pages you have ever seen: multicoloured and multisized fonts, inordinate amounts of exclamation marks and capital letters, tables, checklists, calls to action, “special offers” that are supposedly only active for the next couple of days and so on. Useful information is somewhere in between – thankfully, it usually stands out, so you don’t have to read all the rest. A little tip – most useful information (prices, discounts, etc.) are repeated time and again on almost all pages, so don't waste time looking through the entire site. Taking into account all the bragging and boasting, the prices are surprisingly low: from £12.97 to £24.97, and the only thing that is taken into account in the course of calculation is the deadline. Rather austere for a site with so many special offers and bonuses in its description. Surprisingly, after visiting the site several times and bumping into “online support is offline” message, I managed to finally meet it in working order. So yes, the service really has online chat support, it simply keeps rather irregular hours. When I got to ask my questions directly, I quickly got all the answers, the operator was well-informed and polite. Although samples are mentioned, there is no such thing on the website, so it is impossible to judge the quality of their actual work. However, the texts on the website itself are generally grammatically correct, if extremely annoying. They state that the customer support is online 24/7, which is not exactly true – e-mail support will probably answer your questions whenever you contact them, but chat is available only occasionally. UKDissertation is a rather peculiar agency – an extremely annoying site design together with decent, but irregularly working customer support and rather affordable prices… It is hard to say whether negative aspects outweigh the positive ones, or vice versa.